As the 2017/2018 school began, Hilltop's School of Character team submitted a lengthy application to the New Jersey Alliance for Social, Emotional, and Character Development (NJASECD), including the school’s overview and character education journey. Each year, schools and districts are selected by NJASECD that demonstrate through a rigorous evaluation process that their focus on character development has had a positive impact on academic achievement, student behavior, and school climate. During the NJASECD Annual Conference on May 18, 2018 at Rider University, Hilltop School was selected as a New Jersey School to Watch. This designation was given to just 19 schools in New Jersey in 2018. 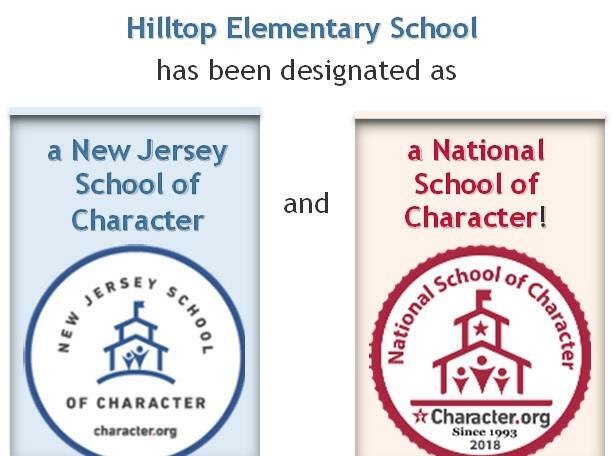 At the same ceremony, it was also announced that Hilltop School earned the distinction as a National School of Character! These honors are a reflection of the teachers at Hilltop, both past and present, school and district administrators, our supportive Board of Education, the parents and community who support our schools and of course our students! At school, our faculty and staff plan lessons on the pillars of character, read books and role play situations so students gain a deeper understanding of respect, caring, trustworthiness and the many other pillars we have covered. At home and around our community, families provide the same guidance and leadership, allowing their children to practice these skills each day. Being of good character is a goal for all of our students. Just as we strive for students' best in reading, writing, math and other subjects -- kindness, compassion, and respect are indicators of success in and out of school. We are honored by both of these recognitions and will seek additional ways to develop our character education program so that we continue to create an environment where students succeed socially, emotionally and academically.